Backed by CoreLogic SafeRent, the largest aggregator of current tenant screening data and analytics in the nation, MyRental assists independent landlords with finding tenants they can trust to be financially responsible and take care of the unit itself. Legislation passed in 2008 required individual landlords to get an on-site inspection and a membership to get access to credit reports because of the impact of identity theft, according to Frank Jachetta, account executive with MyRental. Because of this, it became challenging for the small landlords and property managers to ensure that those individuals who were signing leases would follow through for the entire length of the lease. “MyRental is for the independent landlord who owns and manages everywhere from one to five units and upwards of 100 units. MyRental was specifically designed for those individuals who are unable to get credentials from the credit bureau to get access to a credit report,” Jachetta said. With the CoreLogic brand behind them, MyRental is able to obtain the highest-quality data and information. The service requires no membership fees, and it’s free to sign up; however, landlords can pay for packages that include eviction history, multistate criminal history, previous address history, credit report, tenant score and more. Landlords can also opt for a pay-as-you-go service. 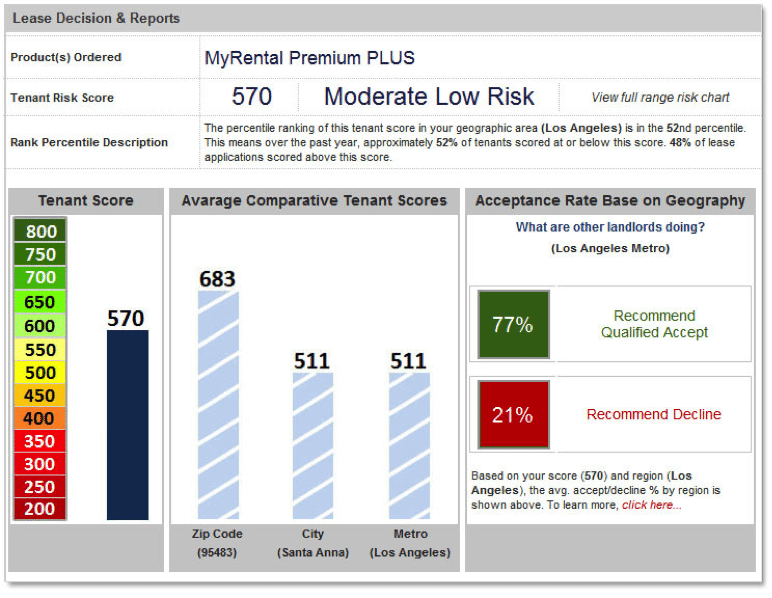 The tenant score is one of the most unique and useful components of MyRental. Similar to a credit score, the tenant score helps to assess the risk of a tenant not fulfilling the obligation of a lease by using data such as application information, payment performance, past due accounts, bankruptcy records, credit bureau data and scores, and eviction history to determine a score between 200 and 800. The higher the score, the less likely the applicant will default on a lease. The Tenant Score PLUS allows landlords to compare the tenant score of a prospect with the average score in the area. A chart showcases how the tenant’s score looks compared to other people in the region, and see if other landlords in the area have accepted other tenants with that score. With MyRental, the tenant is required to authenticate his or her identity online and release reports to the requesting landlord or property owner. Without negatively impacting the applicant’s credit history, the landlord can then view the full credit report and determine whether he or she is a good fit as a tenant in the unit. Because the rental market never stops, MyRental is accessible 24 hours a day, seven days a week. Applications can be processed in minutes through the service, given that applicants are quick to authenticate their identities. From start to finish, the process can take just a few minutes. “Currently, we’re helping landlords screen tenants so they can make more informed leasing decisions as they manage the risk associated with the lease,” said Scott Kennedy, senior director of business development at CoreLogic.